What: Wichita Chamber Chorale performing great choral music for Christmas. Where: Plymouth Congregational Church, 202 N. Clifton, Wichita, Kan. Phone: (316) 204-2315 for information. Cost: $15 general, $12 seniors, $5 students; high school students are admitted free. 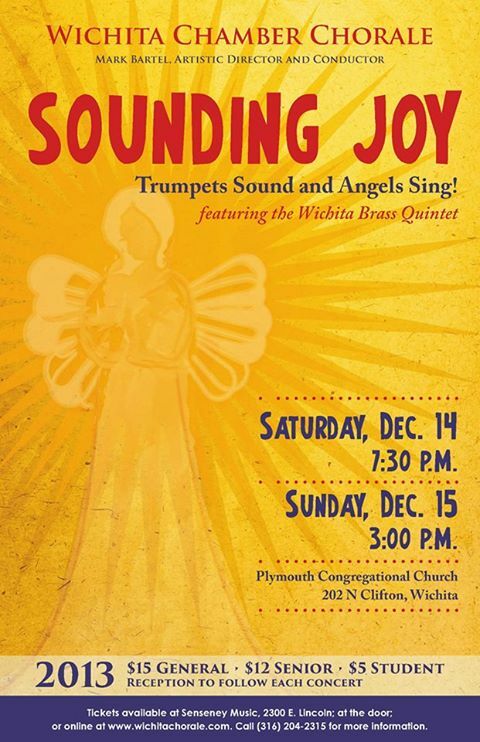 The Wichita Chamber Chorale presents its much-loved holiday concert “Sounding Joy.” This year’s theme is “Trumpets Sound and Angels Sing.” Performances are set for 7:30 p.m. Saturday, Dec. 14 and 3 p.m. Sunday, Dec. 15, both at Plymouth Congregational Church, 202 N. Clifton in Wichita. We bring a full compliment of interesting and inspirational pieces to our annual Christmas program. Works by Palestrina, Praetorius, and Gabrielli date back to the 16th century, and selections honoring Mary mother of the infant Jesus include Ave Maria by Bruckner (19th century) and Ave Maris Stella by Kverno (20th century). The Wichita Brass Quintet will add their festive and beautiful sound to much of the repertoire. The concert also includes folk carols from Virginia and North Carolina, classy arrangements of Christmas popular standards such as Have Yourself a Merry Little Christmas and Go Tell It on the Mountain, and festive traditional carols with brass and organ sure to bring out your Christmas spirit. Be sure to join us for a cookies and punch reception after the concert. We’d love to meet you and hear more about your impressions of the concert. Thanks for supporting the Wichita Chamber Chorale! Tickets are available at Senseney Music, 2300 E Lincoln, Wichita. They may also be purchased online, at the door, or by telephone. Call (316) 204-2315 for more information.